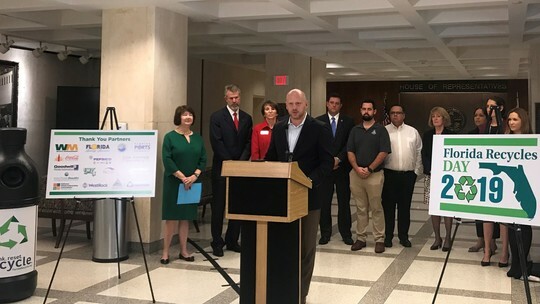 TALLAHASSEE, Fla. – Today, the Florida Department of Environmental Protection joined the Florida Recycling Partnership and other recycling stakeholders in celebration of Florida Recycles Day with a press conference and educational displays at the Florida Capitol. DEP Secretary Noah Valenstein presented a Recycling Recognition award to Northrop Grumman, recognizing the company’s 74 percent recycling rate, outstanding reuse efforts, and commitment to Florida's environment and recycling goals. Additionally, DEP and the American Chemistry Council’s Flexible Film Recycling Group announced the formation of a public-private partnership, the Wrap Recycling Action Program (WRAP), designed to increase opportunities for recycling plastic wraps, bags and film. “DEP is pleased to recognize entities like Northrop Grumman that demonstrate their commitment to environmental protection by implementing environmentally friendly practices and identifying innovative ways to recycle,” said DEP Secretary Noah Valenstein. “We are also pleased to join our partners in launching the WRAP initiative, which aims to reduce curbside recycling contamination through education, and provides Florida’s residents with even more recycling opportunities. Through these efforts, and with the help of our partners, together we can ensure Florida’s natural resources are protected and continue achieving more now for Florida's environment." The WRAP partnership also includes Publix Super Markets, and additional retailers, municipalities, the Florida Recycling Partnership, Waste Management Inc. of Florida, and additional recycling processors and haulers. The initiative aims to build greater public awareness and participation in plastic film packaging recycling at grocery stores and other retail locations, as well as reduce the amount of film packaging inappropriately placed in curbside recycling bins. In 2017, in partnership with Waste Management, MARPAN, Waste Connections and Single Stream Recyclers, LLC., DEP launched a collaborative, statewide public education campaign, Rethink. Reset. Recycle., which serves to decrease curbside recycling contamination and remind Floridians of the basics of curbside recycling: clean and dry aluminum and steel cans, plastic bottles and jugs, and paper and cardboard. The centerpiece of the campaign is FloridaRecycles.org, a website that serves as the hub for the program, housing informational messaging and resources for recycling coordinators across Florida to use in their own counties. DEP's Recycling Program assists residents and industry in protecting Florida's environment by promoting sustainability and waste reduction, providing public outreach and education to avoid contamination, and encourage proper disposal practices, forming partnerships with community groups and stakeholders, and recognizing top recyclers for their environmental stewardship and innovative efforts through DEP's Recycling Recognition Program.